Uniquely this operation is run by a charity. 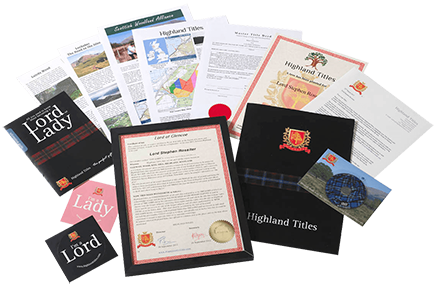 The company operates two web sites, LochaberHighlandEstates.com and Highlandtitles.com, selling Laird of Lochaber and Laird of Glencoe respectively. These are both very professional offerings, having been designed by Hotscot, a Fort William based web design company. They are one of the top Scottish web designers, being responsible for such gems as Fergus Ewing, MSP’s site and the Northern Constabulary website. It doesn’t get any better than that! Highland Titles also appear to be the only company to have mastered social networking with a Facebook page with over 130,000 supporters. Awesome! Unlike all the other sites we reviewed, they have a page dedicated to radio, television and newspaper articles about them, their conservation work and their Laird Titles. Unusual, is that there is a proper “Contact Us” page, with a street address that corresponds to the owner of the domain name, an email address and telephone numbers, both freephone and normal landline. Our email was replied to within 20 minutes and a follow-up telephone call was answered second ring by a helpful human. If only all the businesses were like Highland Titles. We selected “Special Next Day” plus electronic delivery and within an hour a PDF of our documents was delivered to our email box. The next day we received a very attractive folder containing our documents and some extras – best of which was a DVD showing videos of the area and a certificate recording the planting of a tree in our name. The pack is unique in that the plot purchased is defined according to the Ordnance Survey rather than just an unidentified square foot. In addition, Highland Titles operate a plot registry, so lairds can check that their plot ownership has been recorded. This lifts it out of the novelty bucket. The conservation work is more clearly defined than the other companies who claim this point. Highland Titles operate two nature reserves, one near Glencoe and another near Invergarry. So if you want to support a Scottish nature reserve and really want to own a tiny piece of Scotland, this is the one that seems to do the job. There is also an annual meeting in Glencoe so if you want to get involved with the ongoing conservation work you can. Another welcome feature is that Highland Titles are associated with several Scottish good causes, including Wildcat Haven who are saving the Scottish wildcat from extinction. I took your advice after careful reading. You buy a small plot of land for a reasonable price that enables the receiver the right to call themselves a Lord or Lady – and it’s LEGIT! You can change your title to Lord or Lady! 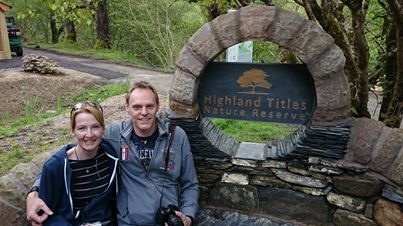 I am very happy to have bought 2 small land plots for my children on “HIGHLANDTITLES.COM – Laird of Glencoe”. These people are very professional and fast !!! Highly recommended !!! The plots are really contiguous. I checked on Google Earth. I thought you might like to know about the alternative Scottish titles that you can buy absolutely legally. First off is a feudal Scottish title. A few come onto the market most years. In 2003 the Barony of MacDonald, which included the ruins of a castle and four acres of land on the Isle of Skye, was sold for $1.5 million. The second option is more involved. The UK grants nonhereditary titles known as life peerages. Mostly these go to politicians, judges, and so on, but it’s possible to get one purely by lending over $1 million to a political party. Cash for Honours. Once this simple route to ennoblement got out, the rules changed slightly, but essentially the method works because political parties are chronically short of funds and they can vote in an unlimited number of peers. One complication: you have to be a UK citizen. On the plus side, you get to sit in the House of Lords. On the other side, everyone knows you are a sleazy scumbag. So in my opinion, unless you are a chrome-plated dumbass, buying a square foot of Scottish soil for $50 is a much better system than buying or for that matter inheriting a title from sleazy shysters for mega bucks. You want recognition and respect? No problem, amigo. Give a little cash for a good cause and make the world a better place. Many thanks for this site. I was minutes away from making a purchase from the wrong Company which I’m sure I’d have regretted. Now I am happy that I have ordered my wee bit Hill and Glen from the right place. I shall continue to follow this site with interest and hope to send some friends this way too. These plots of land make for great gifts. I’m wondering, should Scotland become independent, will the law that makes this possible stay the same? Let us hope so. Keep up the good work. Gave the Highland Tiles to all five of our children as a gift. They absolutely love it and their fiends think its a great idea. Perfect for those who have everything.The gift pack and certificates arrived in Australia within a week. On my daughter in laws side some of her family have visited Glencoe even better. I have been interested in the conservation of the Scottish Wildcat since I was at school. I am just chuffed that Highland Titles is putting their weight behind conserving this Scottish icon. That really is outstanding. Thanks! I’ve found the website http://www.highlandtitles.com/, and done some research, but I can’t seem to get a definitive answer as to if it’s real or not. There are somewhat credible sources on both sides of the debate, and I can’t help thinking that it really is a brilliant conservation idea, otherwise it would have been stopped by now. Thanks for providing me with a definitive answer. FRIENDS TELL FRIENDS ABOUT HIGHLAND TITLES! Heads up folks – we have a serious issue to talk about. You have probably never heard about an organisation called Highland Titles. With almost 140,000 Likes on FB they offer the chance to buy a souvenir plot of land in the highlands and by doing so you also acquire the right to call yourself “Laird” or “Lady”. Please folks think seriously about supporting this venture. It celebrates our real heritage and ancestry. For a modest sum, you too can buy into it and tell your friends about it! Even better, Highland Titles are part of a charity working to conserve the Scottish environment. They work with some really outstanding true conservation groups out there including Trees for Life, the RSPB and Wildcat Haven. What better gift to give your friends and loved ones? Celebrate your heritage and hand it down to your kids. Make a donation to a REAL conservation outfit in Scotland and help conserve Scotland one Square Foot at a Time! Now – one more thing. We know that Highland Titles likes to use Social Media to get their message out. Well, WOW. ‘Mon the Con! We aren’t alone on this – you will be finding this message popping up all over the world wide webs from good people who want to make a difference. So OK Highland Titles. We want to help you save nature and planting trees. I still dont understand the difference between Lord and Laird, which of the two must I choose? Owners of Scottish land are “Lairds”. “Laird” is a Scottish word, meaning “Lord”. If you are happy to take the title in its Scottish form, select “Laird”. If you prefer the Anglicised translation select “Lord”. The terms fan be freely interchanged.